The ocean has absorbed approximately a third of the extra carbon released since the industrial age. A previous article focused on countering acidification of the ocean either directly by adding massive quantities of alkalines or indirectly by adding minerals to encourage phytoplankton growth. This post discusses a more purposeful effort, using the carbon in the ocean to grow plant life which can be used for other purposes. Kelp propogates amazingly quickly, growing up to a foot in a single day in ideal conditions. Profitable uses for kelp already exist as a food source for humans and in animal feed. Additional uses by processing kelp into biofuel or as feedstock for other chemical processes appear to be feasible. Despite its tremendous growth rate, kelp in nature is confined to a relatively small portion of the ocean: it has to anchor itself to the sea floor and take up nutrients present in deeper waters, but must be able to reach the surface to photosynthesize. 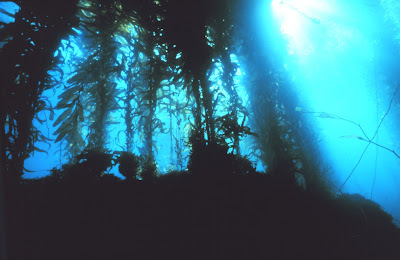 Therefore, natural kelp only grows near coastlines and islands. The Climate Foundation proposes to build Marine Permaculture Arrays stationed about 25 meters below the surface, to provide a point of attachment for kelp. Pumps powered by solar or wave energy would draw water from the depths, providing an artificial upwelling to provide nutrients for the kelp and plankton. Nori podcast #34 features an interview with Brian Von Herzen, the founder of Climate Foundation. Marine BioEnergy proposes robotic submarine platforms which would descend to depths overnight to allow the kelp to take up minerals and nutrients, then ascend close to the surface during the day to allow the plants access to sunlight. The platforms would also be mobile, periodically returning close to shore to allow harvest of the grown kelp and any needed maintenance and replenishment of the platform. GreenWave has developed a training program, legal permitting assistance, and market development for ocean farmers, along with optimized layout for a kelp farm. The plans appear to be for coastal farms, not involving deep water platforms nor extensive automation like the earlier firms. The major food crops like soybeans, wheat, corn, and rice have been tremendously modified from their original forms. As we develop uses for kelp as feedstock in the production of fuels or chemicals or other uses, it is likely that the specific kelp population can be bred to better fit the applications. The ocean has absorbed approximately a third of the extra carbon released since the industrial age. When carbon dioxide is absorbed by seawater it becomes carbonic acid, leading to the gradual acidification of the oceans. alkalinization: to counteract the carbonic acid by adding huge quantities of alkalines to the ocean, such as bicarbonate. Quite usefully, bicarbonate is one of the bi-products of large scale enhanced weathering, which also appears to be quite promising as a mechanism to remove carbon from air. fertilization: the carbonization of the oceans could be addressed by encouraging phytoplankton to grow, which would take up carbon from the water. Different parts of the ocean contain phosphorous, nitrogen, and iron in differing amounts. There are large dead zones in the ocean where plankton and algae grow is stalled due to lack of the needed minerals, not lack of food energy to support them. By adding these three minerals in the correct ratio, phytoplankton will be enabled to consume more carbon. circulation: encourage movement of acidic water from near the surface to the deeper ocean where mineralization processes can absorb it. Ocean-based Climate Solutions, Inc has a description of the mechanism to do this. These mechanisms produce revenue for their funding via the additional productivity of the ocean which they enable. For example fisheries and canning would both increase substantially in these areas. 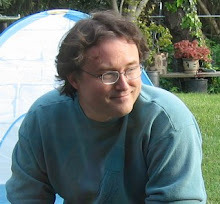 I have been at Google (now Alphabet) for almost 9 years. All things come to an end, and the end of my time at Google is approaching. I expect wrap up current work and exit the company on August 28th, 2018. I have a strong desire to work on ameliorating climate change. I’d like to do this via working on energy production, or carbon recapture from the environment, or other ideas related to climate and cleantech. I am seeking an engineering leadership role. At a BigCo, this would be Principal Software Engineer, Director, etc depending on the company’s level structure. At a smaller company I’d be looking for the opportunity to grow into such a role. I have prepared a resume and a pitch deck focusing on climate change roles, and my LinkedIn profile is public. I’d welcome referrals to companies in these areas, or pointers to opportunities which I can followup on. I can be reached at denny@geekhold.com. Led teams of up to 28 engineers, handling four simultaneous projects.